Frank MacNab – The second leader of the Lincoln County Regulators, who fought for the McSween faction of the Lincoln County War. He was killed by a posse made up of the combined forces of the Jessie Evans Gang and Seven Rivers Warriors at the Fritz Ranch, New Mexico on April 29, 1878. John Mace – A gunman in the Lincoln County War of New Mexico, he was indicted in 1878 for his participation. He was killed by a posse in 1880. Robert Majors – A gunman, he shot and killed former Texas Ranger James Harris in a shoot-out at Santa Cruz, California in the early 1880s. Henry Mamby – A gunman, he shot and killed D.B. Griffin on May II, 1884 in Vermijo, New Mexico. Mitchel “Mitch” E. Maney, aka: Mike Manning – A gunman, he shot and killed Juan Patron in Puerto de Luna, New Mexico on April 12, 1884. A.E. Manning – A merchant and gunman in Northfield, Minnesota, he shot Cole Younger and Bill Chadwell on September 7, 1876, when the James-Younger Gang were attempting to rob the bank. James Manning – A gunman, he was one of the brothers in an EI Paso feud with Marshal Dallas Stoudenmire. In 1882, James shot Stoudenmire in the head and was acquitted of murder. Jim Mansker – A gunman, he was killed at Miles City, Montana in 1894 during a gunfight. Charles Marshall – A member of the Seven Rivers Warriors who fought in New Mexico’s Lincoln County War. He was killed in Lincoln, New Mexico on April 30, 1878, probably by members of the Regulators. Bob Martin – A member of Jesse Evans Gang during New Mexico’s Lincoln County War. Nothing is known of life following the conflict. Charles Martin – A gunman in the Lincoln County War of New Mexico, he was indicted in 1878 for his participation. Atanacio Martinez – Fought with the Regulators in the Lincoln County War of New Mexico. He claimed he shot and killed Morris J. Bernstein in Lincoln County, a shooting credited to Billy the Kid. Afterward, he disappeared. Barney Mason – A gunman, lawman, and Sheriff Garrett’s deputy, he killed John Farris in self-defense at Fort Sumner, New Mexico, in 1880. 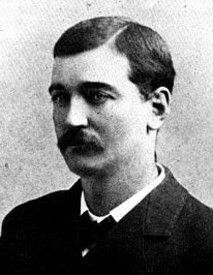 James “Jim” P. Masterson (1855-1895) – Brother to Bat Masterson, James was a lawman in Dodge City and Ingalls, Kansas. He later served as a U.S. Deputy Marshal in Indian Territory. He fought the Doolin Gang and was part of the posse that forced Arkansas Tom Jones to surrender. William Bartholomew “Bat” Masterson (1856?-1921) – Ford County, Kansas Deputy Sheriff and Sheriff, Trinidad, Colorado Marshal, Dodge City Peace Commissioner, U.S. Deputy Marshal In New York. Later a reporter for a newspaper. Died of natural causes in 1921. Jacob B. Matthews – A gunman, he served in the Tennessee Cavalry in the Civil War, and was a hired gunman employed as deputy sheriff by L.G. Murphy during the Lincoln County War of New Mexico. He died in 1904. Oscar Mathias – A gunman, he shot John Coddington on September 30, 1882, at Three Rivers, New Mexico. Peter Menard Maxwell – A cowboy and gunman, he was a friend of Billy the Kid in Lincoln County, New Mexico. Pat Garrett shot and killed the Kid in Maxwell’s bedroom in July 1881. Maxwell died on June 21, 1898. Andy McCloskey – A gunman and buffalo hunter, he dueled with another man at Camp Supply, Oklahoma in 1872. Both men were killed. Sam McCloskey – A gunman, he was injured in the Lincoln County War of New Mexico. William McCloskey – Fought with the Regulators in the Lincoln County War of New Mexico. He was shot in the head and killed by fellow Regulator, Frank MacNab, for being a suspected Dolan-Murphy man on March 9, 1878. Jimmy McDaniels – A member of Jesse Evans Gang during New Mexico’s Lincoln County War. He died of old age around 1950. Ed McGrand – A gunman, he received a life sentence in 1876 for killing a man in Nebraska. James McIntire (1846-1902) – A Texas gunman and lawman from 1860, he was a Texas Ranger, city marshal of Las Vegas, New Mexico, deputy sheriff, cowboy, hunter, gambler, and outlaw with a $1,000 reward on his head for the deaths of two men near Silver City, New Mexico. Chas McIntyre – A gunman, he was jailed in 1874 at Belmont, Nebraska for drawing his pistol and was later lynched. Neal McKeague – A gunman and gambler, he was killed at Church’s Ferry, Dakota Territory in 1890 by a barkeeper. Thomas L. McKinney – A New Mexico gunman who was also a lawman, accompanied Pat Garrett to the shoot-out with Billy the Kid on July 14, 1881. Sherman W. McMasters (1853-??) – McMasters was an outlaw turned lawman who would become one of the six men involved in the Earp Vendetta Ride. It is unknown when or how he died. William Meade – A gunman, he shot J.E. “Dobe” Johnson on February 24, 1884, in Hillsboro, New Mexico in self-defense. Augustus “Gus” Menczer (1856-1882) – A gunman and saloon owner, he killed several men after a shoot-out with his business partner in Raton, New Mexico in 1882. A mob lynched him on June 28, 1882. Felipe Mes – A gunman in the Lincoln County War of New Mexico, he rode with the posse that killed John Tunstall on February 18, 1878. John Middleton (1854?-1885?) – John Middleton was one of the Regulators, alongside Billy the Kid, in the Lincoln County War of New Mexico. James B. Miller, aka: Killin’ Jim, Killer Miller, Jim the Killer, Deacon Miller (1866-1909) – One of the worst of the many violent men of the Old West, James B. Miller was seemingly one of those “bad seeds” from an early age. Often impeccably dressed with good manners, he didn’t smoke or drink and often attended church, earning him the nickname “Deacon Miller.” But, he was a wolf in sheep’s clothing. Miller became a hired gun in the 1880s, a “career” he would continue for the next two decades. Said to have committed as many as 50 murders, he was hanged by vigilantes in Ada, Oklahoma. Captain John Miller – A gunman, he killed 32 men in his life before he was killed in 1888 by John Ables, a tenant on his farm in Jonesboro, Indian Territory, who claimed Miller attacked him. S.C. Miller – A gunman, he shot John Saun in November 1885 in San Marcial, New Mexico. Alexander H. Mills – A gunman who fought in the Lincoln County War of New Mexico, he rode with the posse that killed John Tunstall on February 18, 1878. Ramon Montoya – A gunman in the Lincoln County War of New Mexico, he rode with the posse that killed John Tunstall on February 18, 1878. James “Jim” Moon (18? ?-1881) – Jim Moon was a frontier gambler and saloon owner in Ellsworth and Dodge City, Kansas before making his way to Denver, Colorado. During the Chinese riots in Denver in 1880, an angry mob began beating and lynching the Chinese. Moon stood outside a Chinese business with a gun in each hand and held off the mob alone. He would later state: “These Chinks do my laundry and I was there to see nobody bothered them.” Though he stood up on the immigrants’ behalf, he was a man with a violent temper and abuse manner. On June 16, 1881, he was killed in a gunfight outside his Ocean Oyster Saloon. Lester Moore – A gunman who was killed in Tombstone, Arizona. Thomas Moore – A gunman in the Lincoln County War of New Mexico, he rode with the posse that killed John Tunstall on February 18, 1878. John “Happy Jack” Morco – A gunman and lawman in Ellsworth, Kansas. He killed in a gunfight there with Policeman J. C. Brown. Joe Morgan – A gunman and lawman, he fought Deputy Sheriff Ben Williams in Las Cruces, New Mexico on September 15, 18 95, with Albert Fall. He was later a deputy sheriff and Oliver Lee supporter. William “Buck” Morton – A member of Jesse Evans Gang and a Dolan/Murphy employee during New Mexico’s Lincoln County War. He was killed by the Regulators on March 9, 1878, in Agua Negra Canyon, New Mexico.